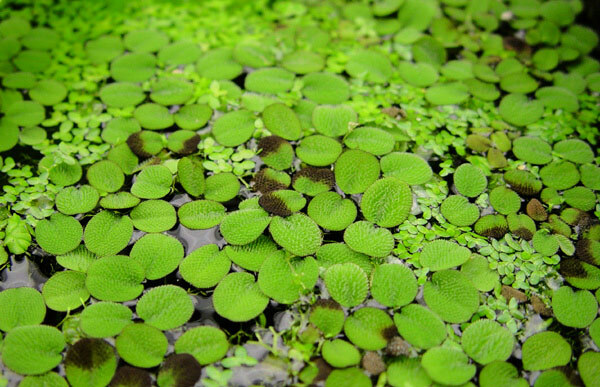 Salvinia is a pond plant native to the Amazon in South America. Its floating leaves are oval and about 1/2 to 3/4 of an inch in diameter, underwater, the leaves turn into roots that reach about 1 inch deep. Salvinias do not have flowers as it is technically a fern and will reproduce by fragmentation or spores. In water gardens, they are a nice addition to the water surface. But this plant should be controlled as it can multiply fast and deplete oxygen from the water making it difficult for fish to thrive. The following is a video of Salvinia in an aquarium, where you can see the details of its leaves and roots.